Composite cheat sheets provide guidance through a complex problem by breaking that problem into a set of smaller tasks. Each task consists of a series of steps which must be performed in order. Composite cheat sheets are launched in the cheat sheet view and show two panels which will be side by side or one above the other depending on the relative height and width of the view. The panel which appears on the left or on top (depending on the view orientation) is called the task explorer and shows all of the tasks which need to be completed and their state. The lower or right panel is called the task detail panel and shows the task which is selected in the explorer. Composite cheat sheets are launched in the same way as any other cheat sheet by selecting Help > Cheat Sheets from the menu bar. If this command is not in the menu, it can be added from Window > Customize Perspective > Commands, and check Cheat Sheets. 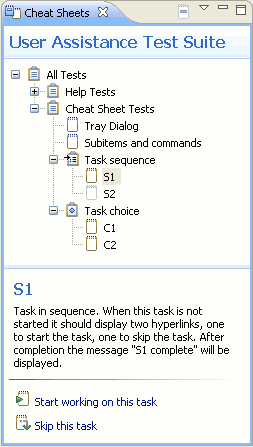 The task explorer is the tree view which shows the tasks and groups of tasks in a composite cheat sheet. Each task will also have an overlay image at the lower right corner it it is in progress, has been completed or has been skipped. Selecting a task in the task explorer will cause that task to be displayed in the task detail pane. Right clicking on a task in the task explorer brings up a context menu which depending on the state of the task will allow the task to be started, skipped or reset. The task detail pane will show different contents depending on the kind of task and whether it has been started. A cheat sheet task which has not been started will show a description and a button to start the task (or if it cannot be started the reason why not). When in progress a cheat sheet task will show a cheatsheet, and when it has been completed it will show a link to the next task. There are three kinds of task groups, "set", "sequence" and "choice". A sequence represents a set of subtasks that must be performed in order, a set represents a set of subtasks that can be performed in any order, a choice represents a set of tasks only one of which should be performed. A set or sequence is complete when all of its subtasks have been completed. A choice is complete when one of its subtasks has been completed. A cheat sheet task represents a single cheat sheet. When a cheat sheet task is first visited the task detail pane shows a description of the task and gives the option to start working on the task and possibly to skip the task. The picture below also shows the images for task sets, sequences and choices. Note that some images are shown in gray, that is because these tasks cannot yet be started because prerequisite tasks have not been completed. A composite cheat sheet may have dependencies which require one task to be completed before another can be started. An example of where this might happen would be if one task created a project and a second task uses that project. In this case the first task must be completed or skipped before the second task can start. 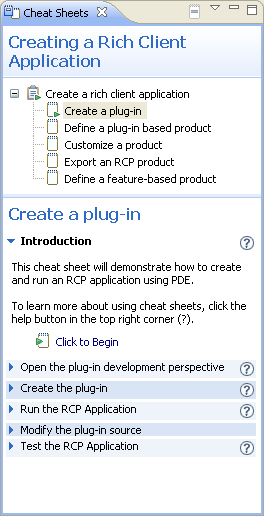 The author of a composite cheat sheet can choose to make a task or task group optional. If a task is optional it can be skipped, either by right clicking on that task in the task explorer and selecting skip from the context menu, or by clicking on the "Skip this task" hyperlink in the task detail pane. Skipping a task will allow tasks which depend on this task to be started. The task detail area will provide hyperlinks which will walk through the tasks in order. It is also possible to perform tasks out of order by selecting the task in the task explorer and starting work on that task. This is useful if you want to go directly to a task of interest without working through all earlier tasks. Right clicking on the root node in the task explorer shows a menu item "Restart all tasks". If selected this will reset the state of every task in the composite cheat sheet. Use this only if you want to reset all tasks. The context menu for any other task will have a menu option to reset an individual task. Any tasks which depend on this task will also be reset, and for task groups all subtasks will also be reset. A composite cheat sheet is closed if the cheat sheet view is closed, if Eclipse is closed or if another cheat sheet is opened. The state of each task is saved so that when the composite cheat sheet is reopened its state will be restored.